Activist cleric Evan Mawarire has announced he will be running for a seat on Harare City Council in the upcoming elections. 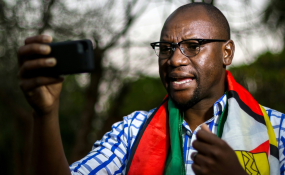 Pastor Mawarire became the face of the 2016 protests against then president Robert Mugabe in a campaign that resulted in the cleric being arrested and forced into exile. The leader of the #ThisFlag activist group will seek election in Harare's Ward 17, Mount Pleasant, under a coalition for independent candidates called the Peoples' Own Voice (POVO). POVO will field candidates in the local government elections. Mawarire confirmed his candidature on his social media platforms this Tuesday, declaring that he could not stand by and watch the Harare continues to deteriorate. "Do you remember the time when we used to get clean water coming out our tapes? "It is possible for us to go back to those days again." says the pastor while holding a glass with water in the minute-long video. He added; "I will be running for council in Ward 17 of Mount Pleasant in the upcoming 2018 elections." Povo is set to launch its election campaign on March 29 at the Harare Gardens.